Let the memories of your thoughtful gift of fine food from Dakin Farm last a lifetime with a keepsake. 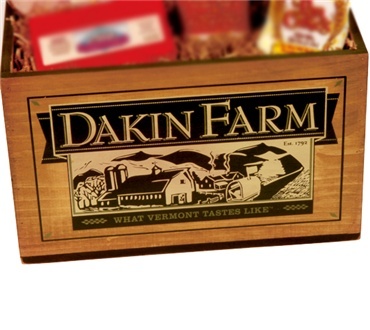 Weâ€™ve teamed up with Vermont Wooden Box Company from Randolph Vermont to hand craft and screen print a nostalgic box with the ultimate in Dakin Farm branding. Each useful box measures: 16â€ long X 12â€ Wide X 10â€ Tall. Just the right size to hold a bounty of our best Vermont specialty foods.